After encouragement from art teachers throughout my early and mid-teen years, I decided to pursue a major in painting and printmaking. I had no idea at the time how to live the artist’s life and of the commitment it takes. Being from Charlotte, NC, I chose UNC-Greensboro, and received my BFA. My schooling did not at that time teach undergraduates how to conceptualize or to think abstractly. I was a long way from NY and the modern art-energized north-east, being situated in the mid-70’s in the South’s bible belt. I mostly rendered the figure or landscape at the time, either in pencil or pastels, and water colors. For a long stint of adult life I didn’t paint; I had jobs doing graphics. Only in the last 11 years did I return to painting. Through selecting ongoing study specifically for non-representational work, I’ve learned you have to develop your own techniques which is very time-consuming but ultimately sets your work apart. My Atlanta location affords me exposure to high quality fine art, and to relationships with many exciting and generous artists from which I’ve garnered important critique and influence. ways that beauty and mystery are manifested. In my work I’m distilling these complexities down to a simplified expression of interesting aspects which to me are intriguing. The study of color pairings and of unusual drawn or collaged forms combined gives me the impetus to keep following unexpected leads. I’m showing my favorite piece right now in a solo exhibit which runs until Jan 31st here in Atlanta at the Stan McCollum Gallery. The piece is “No 18”, a large 60 X 84 work on canvas, which is one in a body of work conceived as pours (literally). There are 8 other pieces in the exhibit in addition to this one. My influenced are only somewhat from this city/area. Here, and by getting to other big cities like New York and Chicago, I specifically look at as many exhibits as possible of contemporary art, of newer even slightly known artists, to pick up on what seems to make their work hum. It’s intriguing and the opposite of boring. I don’t look back, I’m looking forward, but that certainly doesn’t dismiss the influence of the greats like Rauschenberg, Mitchell, DeKooning, Frankenthaler Pollock, etc. What is your favorite restaurant in Atlanta? Bacchanalia was a very memorable dining experience which I’d like to repeat. It’s located in the West side Distract of Atlanta. The table service and presentation both won me over. Pasta da Pulcinella (1123 Peachtree Walk near Colony Square, Midtown) is a favorite for the wonderfully quaint ambiance, meticulous service, superb Italian food. A chilled Mojito ; the mulled mint adds just the right balance of brightness. I have to choose to focus on some aspect of planning every day, otherwise I can get too distracted. I’ve found that breaking down the plan into smaller chunks which are doable keep me motivated to keep up momentum. I think better creatively if I am physically active so I definitely get some workout time during the week. Making one’s studio time a ritual helps to ensure that you show up. This wasn’t an easy thing to learn to do, but there’s no way around it. Studying with a fabulous artists atelier and workshop (www.fineartsworkshop.com) has honed my direction and intent immensely. My work is also currently being offered at a Boston, Mass gallery, Jules Place. Hard to pare this question down to one place, I suppose going to the island of Bali would do in a pinch, to experience that kind of exotic intoxication and because I love being near an ocean. The Greek Isles would be a close second. To be invited by either West Elm or similar brand to generate some pieces for one of their lines. A beautiful piece of original hand-made pottery or ceramics. I can usually find just the right piece for a particular person’s aesthetic. 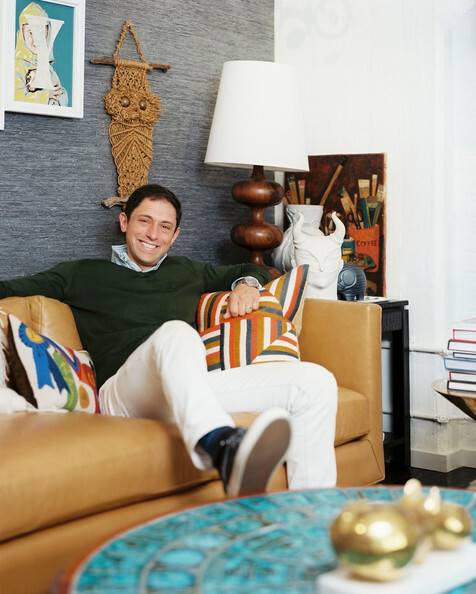 This changes, but right now I’d have to say Jonathan Adler. I admire both the interesting mix of patterns and of colors, and the eclectic yet bright quality that he imbues into all of his vignettes. It’s a very positive vibe. And I’m a fan of his ceramics. I collect hand thrown pottery. That talented individual is Anna Johnson. Also her website: www.annajohnsonjewelry.com. She recently received the Regional Artists Project Grant to afford her being able to build her casting facility. Anna resides in Asheville, NC. She casts in bronze usually, adds bone and fragments. Also, Ana Guzman. Ana is prolific with human interaction recorded in energized, colorful brushwork – her works are done with immediacy and convey lively scenes of city life. She is represented at DK Gallery in Marietta.Ga. A sculpture of an origami-folded boat, rendered in bronze, by sculptor Kevin Box. We picked it out while in Santa Fe, from Shelby Fleetwood Gallery. Box’s works are dreamy and unusual, beautifully conceived. The non-fiction book “Curious” by Ian Leslie. The sub-title reads “The desire to know and why your future depends on it”. It’s about the vital need to develop both epistymic and empathic curiousity. Living and Sustaining a Creative Life, by Sharon Louden, really has up-to-date insights and useful advice on how artists manage to succeed and keep reaching set goals. Colbie Caillat, Darius Rucker, The Avett Brothers (they can sure do a ballard in a smooth way). I never tire of Springsteen or the Eagles or Sting. Really I enjoy a lot of newer artists too, like Katie Perry or The Black-eyed Peas. On a given day in the studio I’ll prefer Yo-Yo Ma or a classical track like the sound track from Ladies in Lavender. I appreciate creativity across the musical spectrum. I am a bit addicted to Architectural Digest, because they manage to keep it both timeless and up-to-date. The weekend NY Times are essential reading; with being in the studio to paint I can only consume so much by way of reading, time-wise. There are many art blogs that inspire and inform, especially Hyperallergic and The Brooklyn Rail. (I guess these are more web sites than blogs). See more of Susan’s portfolio HERE.